Samuel Pompeo, baritone & soprano saxophones/clarinet; Dino Barioni, guitar; Fabio Leandro, piano; Gibson, Freitas, contra bass; Paulinho Vicente, drums. Samuel Pompeo’s baritone saxophone is startling! To hear a baritone being played at this double-time pace is quite exciting. That’s the way this CD begins, at a maddening pace and exploiting the spot-on technique and strength of this Brazilian reedman. The song itself is an odd blend of 1920, Ragtime jazz piano and a more modern, straight-ahead horn, with an undertow of Latin rhythms that corral the musicians like a bunch of wild horses, squeezing them tightly together in a blend of cultures and artforms. The tempos change and fluctuate intentionally. It’s a fascinating arrangement of “De Cachimbo”. The next song was composed by Pompeo’s guitarist, Dino Barioni. It’s titled, “Agua Na Chaleira,” and once again it combines musical cultures in a most unique way. The liner notes explain it in uncomplicated terms. In the 20th century, one new genre of music formed in Rio de Janeiro Brazil and another in New Orleans, Louisiana. Both uniquely blended (from 19th century influences) European polkas, Classical music, Scottish and Mazurca, mixing all genres together with African music and rhythms. Up popped ‘Choro’ in Brazil and ‘jazz’ in America. The only addition I might have is that African Americans created jazz. So, we cannot forget, it also came from the bowels of slavery and the slave ‘work songs’ created in America. 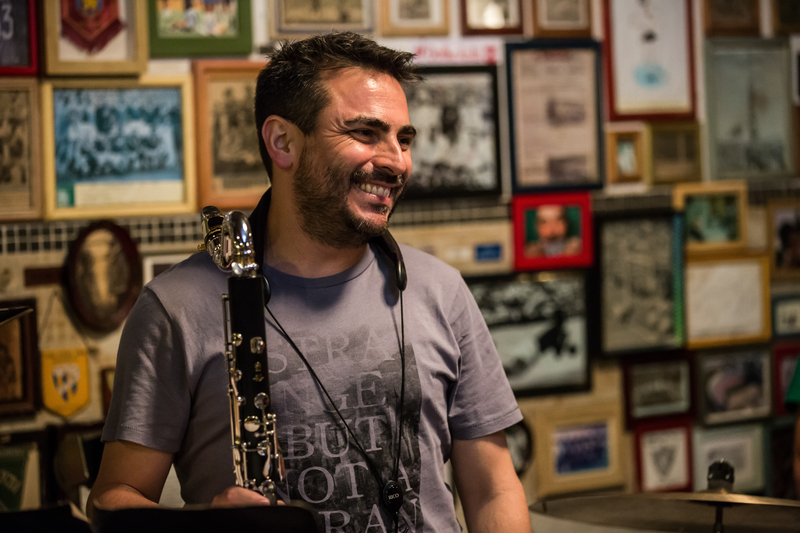 In track #3, an original composition by Pompeo, (“Cave Du 38”), you hear a clarinet or soprano saxophone soloing. It reminds me of the Benny Goodman days of big bands and Swing dancing. This is followed by the very beautiful “Janeiro 15,” another composition by Pompeo. I love the tone and fluidity that Pompeo produces on his baritone saxophone. Another favorite tune of mine is “Choro Vermelho” by Daniel Grajew. It’s a happy-go-lucky arrangement, giving Fabio Leandro time to solo on piano and Barioni to excel on guitar. Pompeo moves from one saxophone to another, showing that his dexterity and technique is unlimited. The concept of this recording seems to be relating the two musical forms, (Choro and jazz) to create a conceptual album that embraces both African American jazz roots and Brazilian roots. The flowering offspring is both artistic and innovative. Jared Hall, trumpet/composer/arranger; Troy Roberts, tenor saxophone; Tal Cohen & Martin Bejerano, piano; Josh Allen, bass; Kyle Swan, drums. Trumpeter Jared Hall has written and arranged every song on this spectacular new release as part of the Mentor Series. On “Wanderer”, the very first composition on this production, each participating musician makes a dynamic statement. There is a space where Kyle Swan lets loose on drums and Troy Roberts sparkles on tenor saxophone, both provocative and enthusiastic. However, Hall is the nut and bolt of this music, twisting everything tightly into place with melodic horn lines and staccato harmonic arrangements. His trumpet solo is delivered tenaciously and with obvious technique and control. Martin Bejerano, on piano, displays a call and response kind of musicality, letting the horns be the answering choir to his two-fisted piano grit. You hear more of this pianist on “Hallways”. It’s a mysterious tune, with a horn unison approach to the melody presentation at the top of the tune. I’m impressed and pleased by Jared Hall’s compositional skills. His music moves me. Josh Allen takes a solo on this ‘cut’, letting his bass explore the outer perimeter of the chord structure atop the lush chords that Bejerano supplies on piano. I find myself eager to hear the next song and enthralled by this composer and his tightknit band. “Love, Laugh and Cry,” is a slow swing with Allen walking his bass and setting the groove in perfect sync with Swan on drums. Roberts adds a swig of blues from the depths of his tenor saxophone, as does Hall, pouring it generously out of the bell of his instrument. I am intoxicated by their presentation. As a debut project for this well-mentored trumpeter, this is an extraordinary recording. I was particularly impressed by Swan, who improvises on his drums beneath the surface of the song, without ever loosing or compromising the tempo or texture of the music. “Allure” (the fourth ‘cut’) was co-written by Sherrine Mostin and is a very pretty composition with Swan adding a Latin feel with his percussive art and Bejerano stepping center stage for a sweet solo. I enjoyed the interplay between saxophone and trumpet, as if they were trading fours or challenging each other with improvisational swords. Tal Cohen takes a seat on the piano bench for “Visions and Dreams” and three other tunes on this CD. He brings a music-box quality to the piano to interpret this composition. I can see the little ballerina twirling in front of the box mirror as I listen to his tinkling, soprano notes and chords that support the bass solo. Jared Hall grounds the tune with his trumpet solo and the image is momentarily wiped away. On “Meditations” I enjoyed the drum mallets and their warm, comforting, rhythmic sound. “Tones for Jones” is right up my groove alley, with blues leaping out to startle my attention. Finally, I get to hear Cohen stretch out on piano with perfectly timed improvised runs and an obvious love of the upper register. I enjoyed his sense of harmony. This is a recording to be enjoyed over and over again. The ensemble is as comfortable and close-fitting as hand to glove. Jared Hall’s compositions are well-written, well-played and his talent and tone on trumpet, undeniably pleasant.